Calling all romantics, this collection is for you. 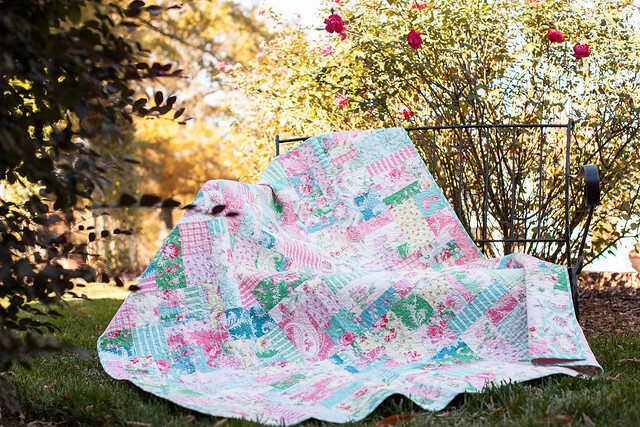 Verna Mosquera of The Vintage Spool's latest fabric collection, Rosewater, elegantly blends the garden and the sea, allowing you to escape to a seaside cottage with an overflowing rose garden. Verna is here to share more about Rosewater, so be sure to stop and smell the roses! Q: Tell us a little about the Rosewater collection. What were you inspired by? 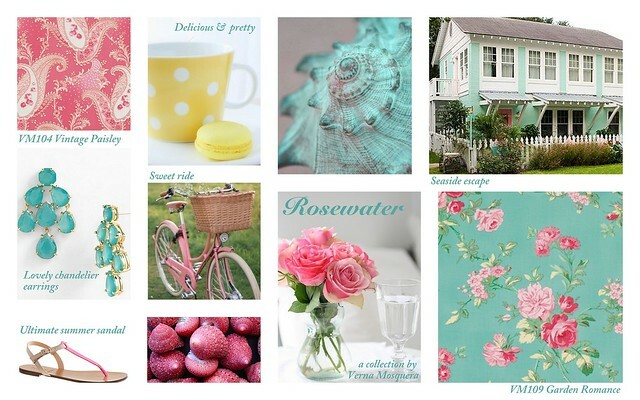 A: Rosewater celebrates the classic beauty of the rose merged with the subtle changing shades of the sea. The rose has long been the symbol of love. Timeless, alluring and majestic, its beauty has been celebrated for centuries. The simple fusion of a rose petals fragrance and fresh water are magical. This collection is fresh and romantic. Its colors are reminiscent of those found in a seaside cottage set amongst a garden of roses. Coral pinks, ocean blues, fresh aquas and sunny yellows create a soothing palette. It is perfect for quilting, children's wear and other home sewing and crafting projects. Sure to be a favorite of romantics everywhere. A: I generally start with a color inspiration. It can be a clipping from a magazine, a vintage card, an old piece of china. Then I often build a story board around these colors. I will select paint chips from my local hardware store, pair those with bits of ribbon, vintage buttons and ephemera. Slowly the board begins to tell a story. Generally I love to work with romantic elements so roses and other flowers always emerge. Then I add geometrics like dots, stripes & plaids. Lastly I include tone on tone prints which are always the perfect way to set off the other prints in the collection. A: While I feel design trends are important I generally design from a feeling I get. Something that moves me. It can be something one of my children says or does or a place I visit. As often is the case while one collection is debuting another is in the design stage. I very much enjoying both the exploration and what is coming together. Q: What projects do you hope to see made with Rosewater? A: My favorite thing about designing fabrics is seeing what people do with them. Often with my pattern design folks will copy the work exactly as they see. With the fabric they are able to let the collection inspire them to various projects so I love to see where it leads them. I've made two quilts, an apron, pincushions and several pillows. I'd love to see children's garments. 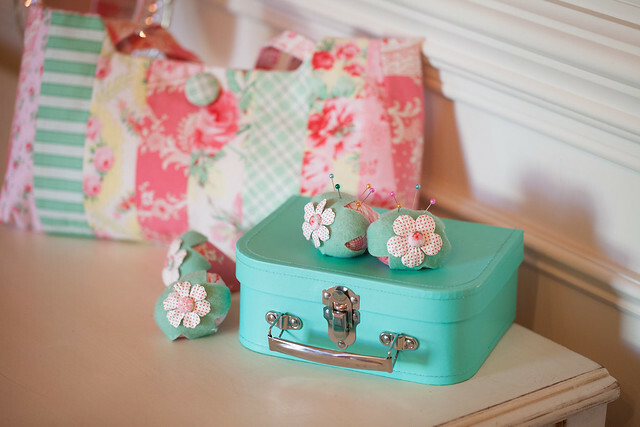 The collection screams "GIRLY" so it will be wonderful to see what folks do with it. A: My style is Romantic & Timeless. 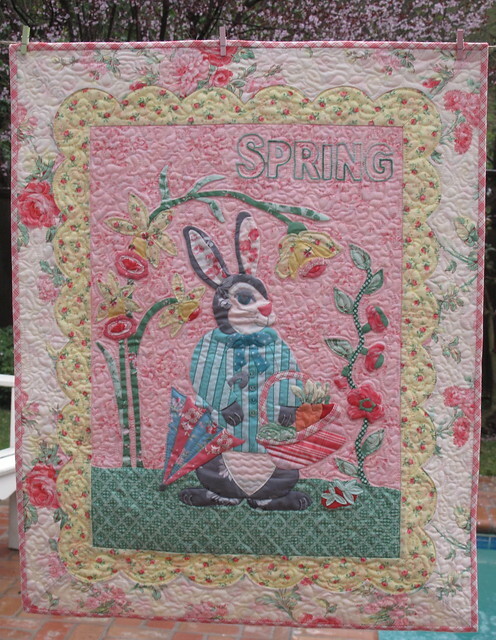 When I first started quilting I dabbled in many of the various assorted pattern and fabric styles. I made many patchwork quilts from such varied prints as 30's, civil war, batiks, primitive flannels and so much more. I noticed that slowly I began to favor and gravitate toward those pieces that were vintage looking with softer colors and time worn elegance. As I began to design my aesthetic grew from that love of vintage and much of my fabric and pattern work is now derived from a vintage inspiration of some sort. While the color palette changes with each collection the core colors tend to be soft in hue and the patterns subtle and romantic. Q: What is on your sewing and quilting bucket list? A: As always, I have numerous projects waiting in the wings. While I work on one, I am often designing another in my mind. This year I've gone back into the studio and have been drawing quite a bit. First small sketches and then full size drawings, soon to become patterns. As with any new year this one brought new ideas and new energy. One of my favorite things to do is draw, so I've spent a ton of time lately doing that. I'm working away on new Vintage Spool applique designs. I just completed the first in a series of four seasonal wall hangings. They are wonderful applique projects with a touch of embroidery. I've used Rosewater and Billet-Doux, my previous collection, in combination. 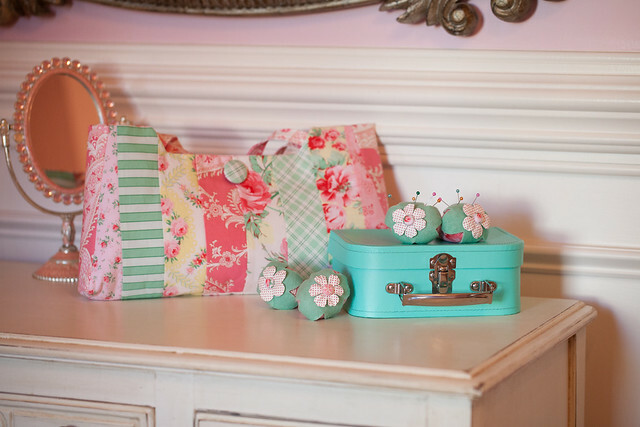 It will also be the project for my upcoming March Vintage Spool workshop, The Spring Fling. I also have several others designs on my list. I will share more about them soon. For now I can tell you, if you are a Vintage Spool fan, you are going to LOVE them!